Visiting Houston and seeking to get a place to swim? Nice option! Don't forget to tell us how did it go. 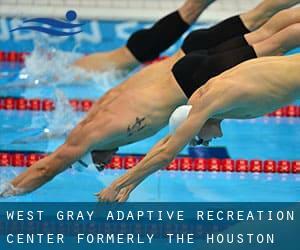 Introducing now West Gray Adaptive Recreation Center (f. the Houston Metropolitan Multi-Service Center Pool) swimming pool, an amazing swimming pool sent by a swimmer like you few days ago. Have you visit this pool? Do you perform here? Please, contact us for those who have info which you believe is gonna be useful and bear in mind from now on you are able to now promote each pool just by sharing this page together with your friends or adding comments in the Facebook boxes below. Come on and assist this pool to be the first in Houston! Among all the activities offered by the center, if you are thinking about swimming you are going to enjoy 25 meters, 5 lanes, Indoors. Just in case you want to get in touch with this Swimming Pool prior to dropping by, we only know the phone number. 9825 Katy Rd. , Houston , TX , USA (Postal Code: 77024). Among all the activities provided by the center, in case you are interested in swimming you might take pleasure in 25 meters, Indoors. Just in case you want to get in touch with this Swimming Pool before dropping by, we only know the phone number. 4400 Memorial Dr. , Houston , TX , USA (Postal Code: 77007). Among all the activities supplied by the center, if you're interested in swimming you will take pleasure in 25 yards, Outdoors. Just in case you wish to make contact with this Pool just before dropping by, we only know the phone number. 2603 Timmons Lane , Houston , TX , USA (Postal Code: 77027). Among all the activities supplied by the center, when you are interested in swimming you will appreciate 25 meters, 6 lanes, Outdoors. Just in case you need to contact this Swimming Pool prior to dropping by, we only know the phone number. 5215 FM 1960 W. , Houston , TX , USA (Postal Code: 77069). This sports center gives 22 meters, Indoors. For this Pool, only phone number is number here. Updated on 2019 8650 Endicott Lane , Houston , TX , USA (Postal Code: 77096). Among all the activities supplied by the center, when you are interested in swimming you can enjoy 25 meters, 3 lanes, Indoors. Just in case you would like to get in touch with this Swimming Pool before dropping by, we only know the phone number. 808 Pease Street , Houston , TX , USA (Postal Code: 77002). Swimmers like you reported 25 yards, 4 lanes, Indoors. Unfortunately we do not have the email address of this Pool, but we can give you the phone number. 16511 Diana Lane , Clear Lake , Houston , TX , USA (Postal Code: 77062). This sports center offers 25 yards, 6 lanes, Indoors. For this Swimming Pool, only phone number is number here. Updated on 2019 111 N. Post Oak Lane , Houston , TX , USA (Postal Code: 77024). Swimmers like you reported 25 yards, 6 lanes, Outdoors. Unfortunately we do not have the email address of this Swimming Pool, but we can provide you with the phone number. 19915 State Hwy. 249 , Houston , TX , USA (Postal Code: 77070). Among all the activities supplied by the center, for anyone who is considering swimming you'll enjoy 25 yards, 6 lanes, Indoors. Just in case you want to contact this Pool just before dropping by, we only know the phone number. 1331 Augusta Dr. , Houston , TX , USA (Postal Code: 77057). Among all of the activities provided by the center, if you are considering swimming you can expect to enjoy 25 yards x 48 feet, 8 lanes, Outdoors. Just in case you would like to make contact with this Swimming Pool prior to dropping by, we only know the phone number. 1980A S. Post Oak Rd. , Houston , TX , USA (Postal Code: 77056). Swimmers like you reported 25 meters, Indoors. Unfortunately we do not have the email address of this Pool, but we can give you the phone number.